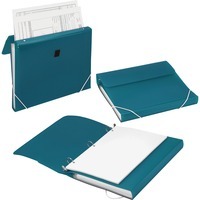 Samsill Duo 2 in 1 OrganizerRing Binder SAM10134 $10.03 Two in one organizer combines a three ring binder and seven pocket file to provide a more efficient way to manage your important papers and documents. Durable polypropylene construction is water resistant to keep your documents protected from light moisture. Dual elastic bands provide a secure closure and offer easy access to each tool individually. Three ring binder with 1 round rings holds up to 225 letter size items. Accordion style, expanding file includes write on index tabs for customizable organization. Organizer is perfect for keeping assignments, lists, medical files, financial documents and more.